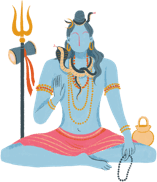 Ma Manasa Devi, the snake goddess, is worshiped by Hindus, mainly for the prevention and cure of snakebites and infectious diseases like smallpox and chicken pox as well as for prosperity and fertility. She stands for both 'destruction' and 'regeneration', almost akin to a snake shedding its skin and being reborn. The idol of the goddess is depicted as a graceful lady with her body, adorned with snakes and sitting on a lotus or standing on a snake, under a hooded canopy of seven cobras. She is often seen as 'the one-eyed goddess' and sometimes portrayed with her son Astika on her lap. Also known as 'Nagini,' the female serpentine avatar or 'Vishahara,' the goddess who annihilates poison, Manasa, in the Hindu mythology, is believed to be the daughter of sage Kasyapa and Kadru, the sister of the serpent-king Sesha. She is the sister of Vasuki, king of Nagas and wife of sage Jagatkaru. A simplified version of the myth regards Manasa as the daughter of Lord Shiva. Legends have it that she was rejected by her father Shiva and husband Jagatkru, and hated by her stepmother, Chandi, who scooped out one of Manasa's eyes. So, she appears to be foul-tempered, and benevolent only towards her devotees. Manasa, due to her mixed parentage, is denied full Godhead. Ancient Hindu legends in the Puranas, narrate the story of the birth of this powerful serpentine goddess. 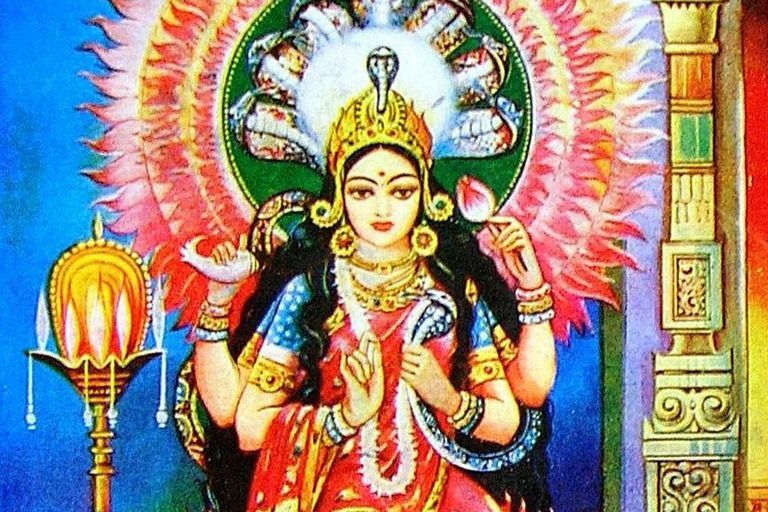 Sage Kashyapa created goddess Manasa from his 'mana,' or mind, so she could control the reptiles that were creating havoc on earth and Lord Brahma made her the presiding deity of snakes. It is believed that Lord Krishna granted her divine status and she established herself in the pantheon of gods. During the monsoon season, Goddess Manasa is worshiped, mainly in the eastern Indian states of Bengal, Assam, Jharkhand, and Orissa, throughout the months of June, July and August (Ashar - Shravan), a time when the snakes leave their nesting ground and come out into the open and become active. In Bangladesh, the Manasa and Ashtanaag Puja is a month-long affair spanning July and August. Devotees pay obeisance to goddess Manasa and perform various 'pujas' or rituals to appease her. Special 'murtis' or statues of the goddess are sculpted, various sacrifices made, and prayers chanted. In some places, worshippers are seen to pierce their bodies, poisonous snakes are displayed on the altar, and live shows depicting the life and legends of Manasa Devi are performed.